We’ve just launched a redesign of our portfolio site and blog. The site aggregates content from our Flickr, Twitter, and YouTube sites, embedding it in our new website. For now, we’ve added simple links to our Facebook and Linked In pages. We may expand our integration with these sites in the future. Along with extending our reach into these social networking platforms, the site is easier to maintain and update. The site is powered by WordPress. While this is hardly revolutionary, having WordPress work as our de facto content management system gives us a flexible platform for our Web presence. Our portfolio and products are custom “pages” in WordPress. The WordPress plug-ins Tweet Blender and Flickr Feed Gallery display tweets and photo thumbnails on the front page. The portfolio itself contains descriptions for 14 projects. We’ve gone with a new editorial style for presenting project descriptions along with an improved layout. Each project description contains links to either YouTube videos or Flickr photos (or screen shots). We use Adobe Flash to integrate these media items into each portfolio piece. “Custom fields” in WordPress are used as hooks to connect to remote content and control the layout. The redesign of the portfolio site is our 4th since the company was founded in late 1999. Here ‘s a look back on some of the earlier designs. 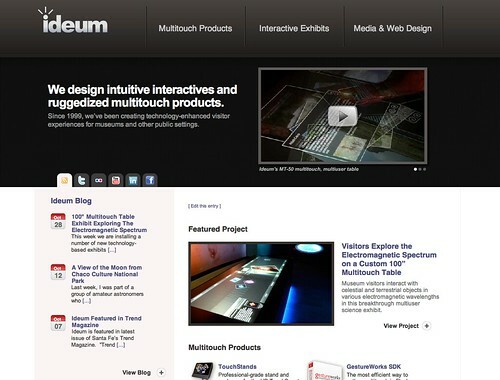 Category: Design, Flash, Flickr, Mashups, Multitouch, Programming, The Web 2.0, Web 2.0 Sites.